"In the 22nd century, the Daleks have occupied planet Earth. By the 43rd century, only a handful of humans survive. Still further into the distant future, a Thal scientist must choose whether to betray his heritage, or see the universe destroyed. What could possibly be worse than that? 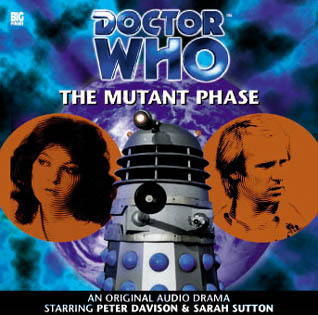 The Mutant Phase..."
What did you think? What was up with that Mutant Phase? Did you like the return to continuity from the Classic serials? Ok, I thought this one was kind of awesome. First of all, it goes back to the Dalek Invasion of Earth in the 22nd century. Very cool going back and revisiting old stories. It's a very timey-wimey story actually. They're sort of going all over the place and it took me a little bit to figure it all out, but it's pretty great. It's actually sort or ridiculous when the Doctor is explaining what happened at the end. "So it never happened?" "Uh, not quite." It all makes sense eventually though! I like that this one had a sort of complicated timey-wimey story to it but still was easy enough to follow and keep track of. I think my favorite part is the Dalek Emperor trying to explain to the past Daleks what's going to happen with the Doctor making snide comments the whole time. It's really sort of hilarious. I thought it was interesting that this story revolved around the Doctor actually having to help the Daleks, not defeat them. It also does fun things like address the 'laws' of time travel. Poor Nyssa is so confused the whole time. Good thing we have her as a plot dump character to help us be less confused as well! Oh my... this was really fun. I loved all the characters. It had a lot of twists and turns that added to the story. The accents were all fun especially the Kansas robomen and the German doctor. I love the Doctor trying to explain the paradox at the end. It gives more information on how paradoxes work, especially so many of the stories rely on them. The last ten minutes or so were just spectacular. That was a blast. This is now in contention for my favorite audio drama I've heard so far. It moved by so fast, the threat of the mutants felt very real, the Daleks being afraid was really effective. Yet it's all setting up (rather smoothly) for its big conclusion that was so much fun with, yes, plenty of timey-wimey-ness. I love how it all connected to The Dalek Invasion of Earth right down to the Emperor laying out the plan. The Fifth Doctor has never been funnier than what he has to say in the last 10 minutes. Really really fun stuff.